Singapore and U.S. forces in the Strait of Malacca. 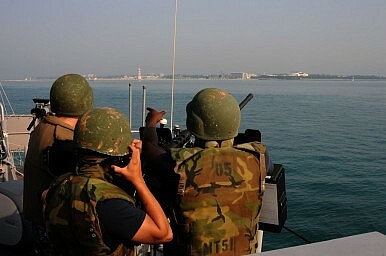 Indonesia and Malaysia are both stepping up their fight against piracy in the wake of growing security concerns in surrounding waters, news sources reported August 27. Piracy is hardly a new issue for Southeast Asian states. As I have written before, the region is a logical target for such attacks as it is home to vital shipping lanes through which about half of world trade and a third of the world’s oil supply pass (See: “Over Half of World Piracy Attacks Now in ASEAN“). Despite notably enhanced regional cooperation in recent years to address piracy concerns, incidents have nonetheless continued to be on the rise. According to the International Maritime Bureau, the first six months saw a total of 134 incidents of piracy and armed robbery, an increase from 116 during the same period last year. ReCAAP, a Singapore-headquartered anti-piracy organization, recorded six piracy incidents in the straits of Malacca and Singapore on 21 and 22 August alone. In response, regional states including Indonesia and Malaysia have been strengthening their efforts. Malaysia, according to Zulkifli bin Abu Bakar, the director of maritime affairs in the MMEA’s crime investigations department, has deployed a helicopter-equipped special task and rescue (STAR) team at Johor Bahru. Team members, Zulkifli told Reuters, would sometimes be deployed on merchant ships operated by Malaysian government-linked firms. “The STAR team is in addition to the other MMEA personnel tasked to combat anti-piracy/sea robbery. I can’t tell you the number of personnel, but (it is) formidable enough to undertake any anti-hijacking operations,” he said. In addition, Malaysia as well as Indonesia have both also focused their efforts on enhancing patrol cooperation and coordination. Indonesian officials say their recent efforts have already proven rewarding. “It’s not a new (rapid response) team (for Indonesia), but only enhancing patrol cooperation and coordination … especially in (the) Malacca area. We have communicated and the result is significant,” said Zainuddin, an Indonesian Navy spokesman. Malaysia, too has looked to boost coordination and cooperation. Following the August 8 hijacking of MT Joaquim, a Singapore-registered vessel in the Straits of Malacca, Malaysia’s defense minister Hishammuddin Hussein proposed that the country carry out joint patrols with Thailand, Indonesia and Singapore. Discussions have also been ongoing between ASEAN countries about joint anti-piracy patrols in the South China Sea. Such measures are not without challenges, however. Shahidan Kassim, a minister in the Prime Minister’s Department, said earlier this month he was opposed to Hishammuddin’s plan because Malaysia was capable of handling the issue on its own and inviting other neighbors might raise questions about jurisdiction. “Thailand and Indonesia have never invited us to patrol their waters. So why should we do the same as there would be confusion in terms of jurisdiction and law,” Shahidan said.